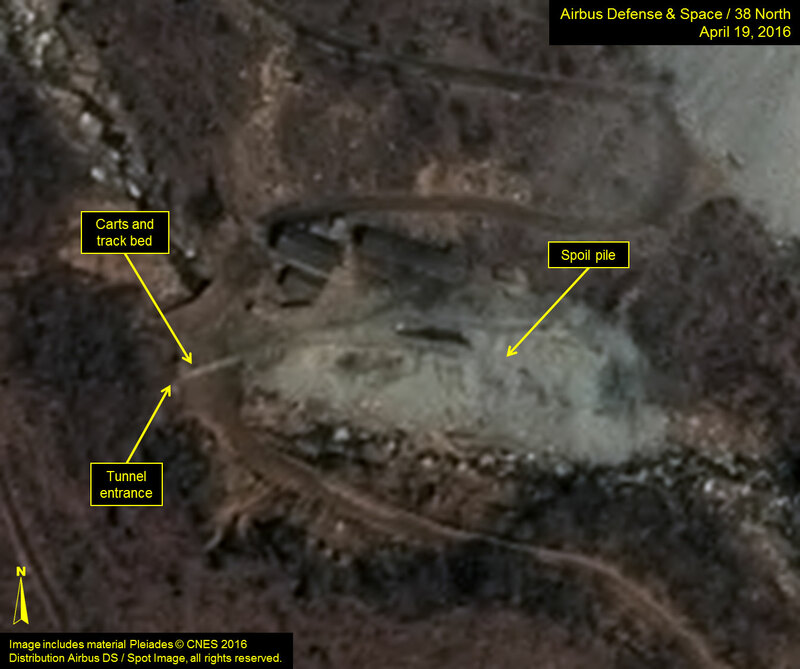 New commercial satellite imagery of North Korea’s Punggye-ri nuclear test site from April 19 shows limited vehicle and equipment activity at the North Portal and Main Support Area as well as indications of resumed excavation operations at the West Portal. These activities by themselves do not establish that test preparations are imminent. However, the possibility of an impending test cannot be ruled out. 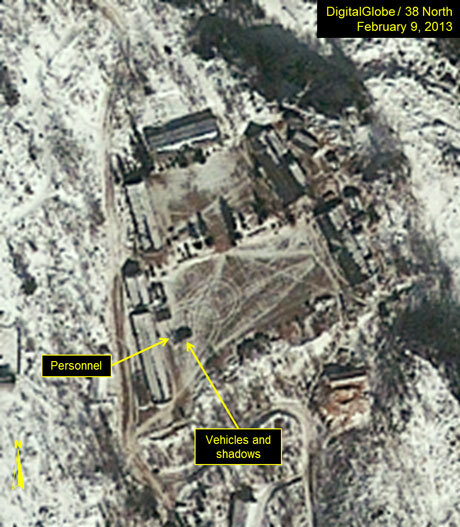 Pyongyang has clearly demonstrated, with its fourth nuclear detonation this past January, the ability to conduct detonations on short notice while masking indicators of its preparations from satellite view. 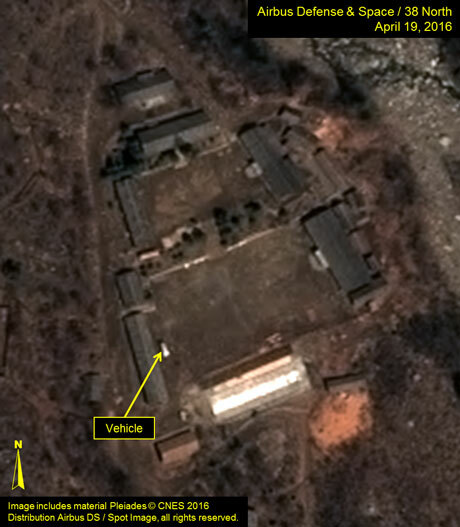 Limited movement of vehicles and equipment at the North Portal—site of the past three North Korean nuclear tests—continue between April 14 and 19. While two trailers or vehicles were observed outside the entrance to the North Portal on April 14, only one single trailer or vehicle is present on April 19. Figure 1. North Portal remains active. A low-level of activity continues at Punggye-ri’s Main Support Area as it has throughout 2016. 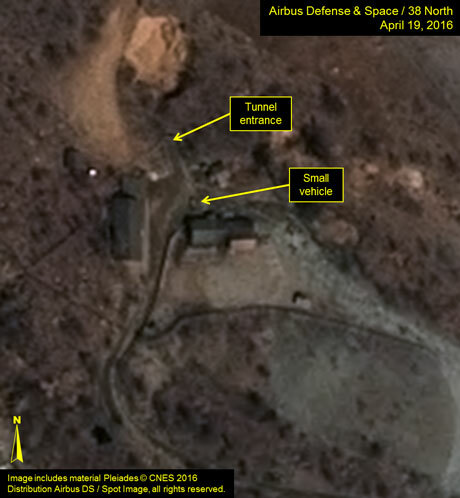 Imagery of the area from April 19 shows the presence of what appears to be a truck, probably the same vehicle identified in imagery from April 14. The truck’s exact purpose remains unclear although it is worth noting that its location is similar to the spot where one, possibly two vehicles and personnel were observed three days prior to the February 12, 2013 nuclear test. Making a connection would require identifying the purpose of the truck itself which is not possible given existing commercial satellite capabilities. Figure 2. Vehicle parked in the Main Support Area, with similar positioning as vehicles prior to 2013 test. Imagery indicates that excavation activities are about to resume. 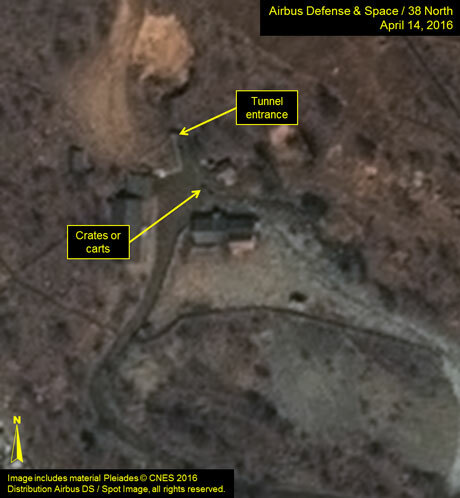 On April 19, what appear to be two small mine ore carts are present on the track crossing the road from the tunnel entrance to the spoil pile. The track bed likely consists of granite fines laid over the rails to enable vehicle traffic on the road to pass over. The presence of the two carts crossing the track in the middle of the road and the absence of any notable changes in the spoil pile suggests that tunnel excavation operations are about to resume, or have recently resumed, for the first time this year. Excavation operations can be undertaken concurrently with preparations for a nuclear test, as was the case during the run-up to this January’s detonation. Such a concurrent activity could be part of the North’s camouflage, concealment and deception procedures for the facility. Figure 3. Excavation may have resumed at the West Portal.